Streamline the way your school handles cash by promoting, selling, tracking and processing all school items online. Shopping online is becoming more and more popular because it's fast and convenient. If companies like Amazon and Overstock can capitalize on this trend, why can't your school? Active Network's intelligent online school store solution, the WebStore, gives administrators, athletic departments, activity directors and student clubs the ability to sell products and raise money online. A WebStore is an easy way to increase cash flow, especially when budgets and headcounts are at a minimum. Parents appreciate the convenience of browsing and paying online, whenever they have the time. And school administrators can automatically process payments for school items��from prom tickets and yearbooks to parking and activity fees��without lifting a finger. 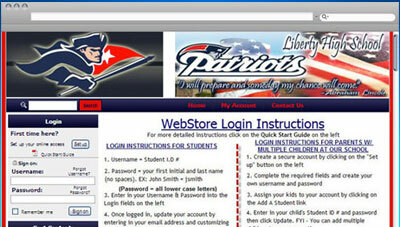 Incorporating an online school store will consolidate and streamline the way your school handles money. It's not only a more efficient way to collect payments, but it's much more secure. Instead of cash or checks that pass from parents to students to teachers to bookkeepers, payments are made online and speed directly into your bank account without passing through a multitude of hands. It's easy and quick. Ultimately, an online school store is the best way for K-12 schools and school districts to promote, sell and process all school items. Our financial secretaries love the WebStore. It saves so much time. ��.the reconciliation is so much faster whether it's 5 or 500 hundred people they're helping. Last year we had 24K in outstanding student debts at our school. With the use of the WebStore and allowing parents to pay fines by credit card and being able to email parents through our WebStore and Tracks with balance due letters, we've been able to reduce our outstanding debts down to 9K this year.